Phenomenal starting power and massive deep cycle reserve power in one battery! Some batteries provide enormous cranking power. Others, deep cycle reserve power. The revolutionary ODYSSEY PC1750 battery is designed to do both. How is this possible? The answer begins with flat plates made of 99.99% pure virgin lead - not lead alloy. Pure lead plates can be made thinner, resulting in more of them in the battery. More ODYSSEY battery plates mean more plate surface area. And that means more power - twice as much as conventional batteries. 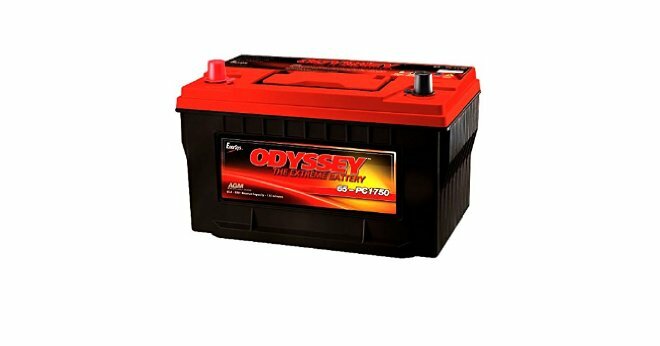 In fact, ODYSSEY batteries are capable of providing engine cranking pulses in excess of 1750 amps for 5 seconds - double to triple that of equally sized conventional batteries, even at very low temperatures. And they can handle 400 charge-discharge cycles to 80% depth of discharge. This extreme combination of power and performance makes ODYSSEY batteries perfect for a range of applications, including automotive/LTV, marine, commercial, and powersports. Designed and built to last up to 3 times as long. Thanks to rugged construction and AGM (Absorbed Glass Mat) design, ODYSSEY batteries have an 8-12 year design life and a 3-10 year service life. Welded intercell connections enable it to withstand extreme vibration, and AGM design holds acid in place to prevent spills, even when installed on its side.